If you are familiar with the SEO landscape, you will know that how SEO ranking can affect a business. Based on the ranking result, it can easily make or break a business. In this ever changing world, SEO techniques can change within seconds and if you don’t keep yourself updated with these techniques, it can hugely affect the website’s rankings. 2016 is already known to be a significant year with Google’s major new algorithm change. There are several factors which are used by the Google ranking algorithm such as the shift in the user’s habit of surfing a site, a way in which searchers are consuming the results, and in fact, even the queries of the users are witnessing a vast change. Staying ahead of the curve is essential. As such, it is important to know the SEO techniques which can be very useful for 2017. Often users place their search queries in the form of a question. This is when you will get to see that Google provides you with an answer in the form of a featured snippet. It is often displayed on the top of the result pages in the form of bullet points. Thus, it helps searchers to find their answers directly on the result pages and they are no longer required to click on the links or open pages. Social media platform is turning out to be a valuable source for gaining user’s feedback. Google is now increasingly focusing on the social media activity of the sites in order to consider the ranking of the site. This trend is also going to stay in 2017. Engagement usually involves holding the attention of the user. It has been seen that search engine giants try to reward the sites with high rankings that provide strong user engagement. Engaging and informative content not only catches the attention of the visitors but also the web crawlers. Thus, the content should be drafted in such a way that is rich with keywords and relevant to your business. In fact, readers should feel the urge to share the content. Thus, a good content can help in boosting traffic and ranking of the site. For SEO campaign it should be the most important thing. Keeping in mind the target audience, the target keywords must be researched. This will help you to come up with high-quality content that can easily target the customers and increase Google ranking. With the Possum update, local search results page has been optimized for rank listings by focusing on geo-proximity. With this update, even businesses outside city limits are getting the advantage of ranking their websites higher. People nowadays prefer to use mobile platforms or apps for searching a site. Thus, the sites, as well as the content, should be mobile friendly. It can affect hugely the ranking of the site. 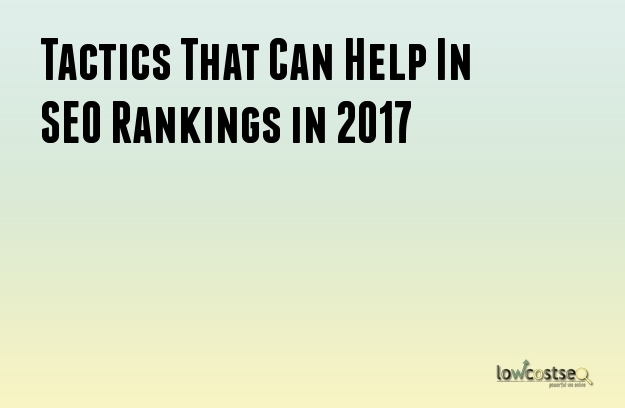 Though SEO trends keep on changing, these techniques will remain vital in 2017. With these SEO tactics, you can easily take stock of your site’s current ranking position and improve it. John Heche is an SEO expert with 15 years of experience. He keeps himself updated with the latest SEO changes and helps out businesses in increasing their rankings.